If there was not a more perfect food, it would be one that combines chocolate and peanut butter. Most of us know this. But long before I came across this chocolate peanut spread (now more affectionately know in my house as peanutella), I was first introduced to Nutella. 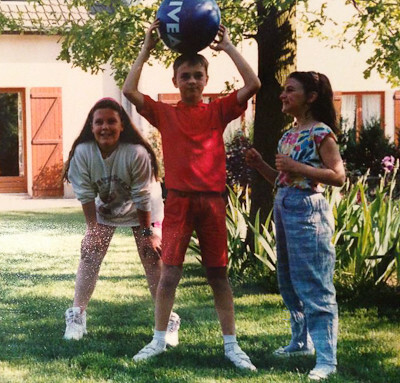 I was a 10 year old kid staying with near-strangers in a far-off land. It was my foreign exchange program trip to France and I felt so, so out of place…and more homesick than I could ever have imagined I would be. 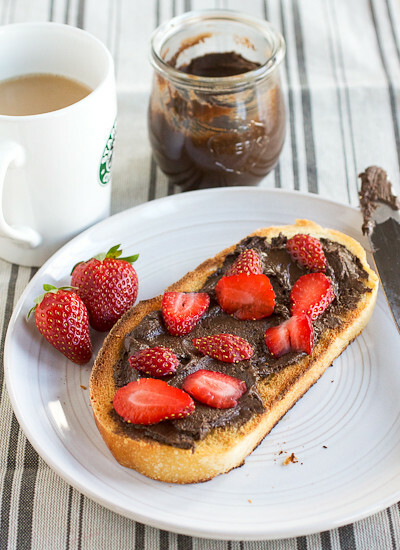 But the Nutella showed up on the breakfast table with some type of delicious bread every single morning and somehow, this eased the angst just a little. I don’t know how popular Nutella was in the States in the late-80s but we sure never had it in our house so this was certainly a special treat for me. Shortly after I arrived home, my pen pal, Fabien, came to stay with us. And as foreign and revolutionary as Nutella was to me, peanut butter was to him. A food that my American house was never ever without, and this was truly his first time ever eating it! Needless to say, he had more than a couple jars of the good stuff packed in his suitcase when he headed back home. This peanutella (chocolate peanut butter spread) is the perfect way Kyle and I can enjoy Nutella without, you know, killing him from his tree nut allergy. It marries deep, dark chocolate with peanut butter and some sugar. And it’s heavenly. 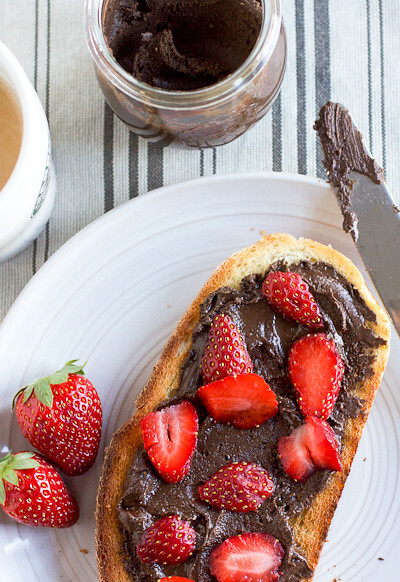 It spreads just like Nutella and gets all melty and smooth when spread on a freshly toasted piece of good bread. A few sliced strawberries or gawd, banana slices!? Or folded up in crèpes? Or slathered across some pancakes? Breakfast in a heartbeat. And great memories of some very dear friends as a bonus. Pour the peanuts into the bowl of a food processor and grind them for about 5 minutes. Then they’ll become more of a paste and finally, they’ll liquefy. Scrape down the sides as needed. With the processor off, carefully add the cocoa, sugar, 1/4 teaspoon salt and two tablespoons of the oil to the bowl. Process until well blended, for an additional 1 minute. Add more up to another 1/4 teaspoon salt if needed. If the spread is too thick (you'll know), add the last tablespoon of oil. Stored in the refrigerator in an airtight container, the chocolate peanut butter spread will keep for a week or two. When it is full chilled it will become thick and spreadable. With the processor off, carefully add the cocoa, sugar, 1/4 teaspoon salt and two tablespoons of the oil to the bowl. Process until well blended, for an additional 1 minute. Add more up to another 1/4 teaspoon salt if needed. If the spread is too thick (you’ll know), add the last tablespoon of oil. I’m so glad that I hid the peanuts you gave me to make your homemade PB. Now, instead, I will try this. I guarantee you will love this, Mom! oh goodness, this sounds fabulous. chocolate pb nutella? yum! Oh it was totally crazy…but so much fun at the same time! Our families are still good friends and we’ve visited each other quite a few times since. I’m so excited to try this!! I’ve just started making my own peanut butter and I’ve been looking for variations to spice things up. Yay! I love making my own PB, Cookie Butter, and various spreads. And I love Nutella! Yours looks so good! I love making my own nut butters! Chocolate PB was one of the first I made, and while now I like doing some weirder flavors, chocolate remains a favorite! 🙂 Definitely need to make a batch soon. Ooo, I’d love to hear what kind of flavors you make!! This is such a great idea! And so simple to make! YUM! I can’t wait to try this! 🙂 It also happens to be Gluten-Free so it’s safe for me to eat! Woohoo! Penutella sounds like an amazing breakfast idea. Looks delicious and healthy with the bread and the strawberries. Thanks a lot for sharing the recipe.